Seen and Heard by Lakshmi Vishwanathan - Ah… Aah.... Aharya! In Bharatanatyam as in Odissi or Kathak, the costume is a distinct statement of identity. Looking at the costume one need not have any doubts about the style of dance. When I danced Kuchipudi, I made that costume which had a particular design with a ‘Kachan’ visible at the back, indicating a distinct Telugu style....an echo of the nine yards saree worn by the rural women. 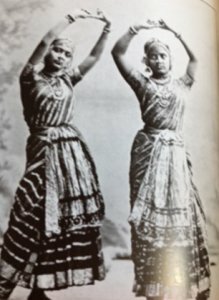 Suddenly, Bharatanatyam dancers also started wearing this ‘Kachan’ type of costume, except that the front fan was the one commonly seen in Bharatanatyam. I don’t think this innovation was necessary for the success of the dance. 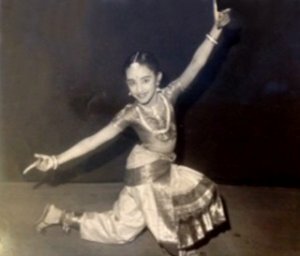 The hugely popular Yamini Krishnamurthy raised the hemline of the regular costume in her heydays to show more legs, and wore blouses with what was known as an attached ‘Kachai’ dispensing with the ‘davani.’ It suited her dance and her personality. Rukmini Devi also wore a draped ‘Kachai’ in her early costumes which suited her personality. 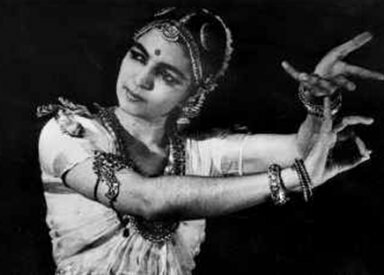 Some say Rukmini Devi was the first to wear the pyjama-fan-sash Bharatanatyam dance dress, said to have been designed and stitched by her friend, an Italian. Her costumes used Benares sarees too in a sophisticated style as seen in the old photos. They were a departure from the nine yard unstitched saree worn over satin pyjamas by the early Thanjavur dancers who came to Madras. Pictures of them show that they wore cotton sarees with apron-like fans which had faux tissue and stripes of Thuyya zari borders. In this old style costume, one would see a ‘Kachan’ at the back, which ensured free leg movement. The girls from Thanjavur were so young that in old black and white photos they look like dressed up dolls. With the passing of time, we have drawn a Lakshman Rekha around us when it comes to costuming, particularly for solo dance. No designers, only tailors help dancers. I daresay the tailors of today with stupendous global orders are indeed a committed lot. I genuinely applaud their skills. In the olden days, mothers with impeccable taste supervised this aspect of dance. My mother Alamelu, known for her sense of style and good taste, did so until I inherited that eye for beauty. The general trend now is... more color, more tested zari, and a lot of shine... Hmmmm... good for sprightly young kids doing their arangetram! They look nice in everything so long as the costume is well tailored. And some are wearing more stylish subtle shades nowadays. The costume is not yet as blingy as in Bollywood or the ready-mades worn by our trendy middle class children going on scooters with parents to the beach. That too might hit the Bharatanatyam stage... wait! I think mature dancers need guidance in choice of design, colors and combinations for their costumes. The most important aspect they should consider is their own height and weight. Slender and tall figures can take some busy looking costumes. The others should tone down and go for a sleek flattering look rather than too many contrasts, borders, motifs, checks, stripes, polka dots etc. With our rather basic and bright lighting, the dancer is at an additional disadvantage when she looks cluttered up. Let me not be accused of partisanship. I observe the costumes of male dancers too. I think the current attire of most of them has its origins in the backyard of Kalakshetra. For those early years of her experiments, Rukmini Devi dressed them up in simple dhotis, bound at the waist with a colorful dupatta. With bare upper bodies and some nice jewels, they looked like priests in a temple. No male dancer has attempted to change that stereotype let alone attempt to look like Uday Shankar or Ramgopal. Those two international stalwarts belonged to another era. They were inspired by sculptures and succeeded in looking like dancing gods! I do wish the male dancers today would be a bit adventurous, design some interesting tops, and use a variety of fabrics. Perhaps some dancers who do not see themselves as career performers can become costume designers? They need to do a course in design, if they have an aptitude for it. A sense of aesthetics and a sensitivity to shapes, lines, movement patterns of the body, color and texture are important. I do hope young designers will emerge to design costumes, with a sense of style, which does justice not only to the dance and dancer but also make use of our vast variety of Indian fabrics, particularly the hand-woven. Heritage is about fabrics too! With the busy season ahead, dear dancers, good luck with your visits to the tailor!